Have you ever wondered what God is saying about our current financial situations? Here it is. In the October 2015 General Conference of The Church of Jesus Christ of Latter-day Saints we were given some wonderful prophetic council for our days. Since some of these applied to money issues I thought that I needed to take advantage of the opportunity and pass the council along. “If you never choose to go into debt, you will avoid the possibility of bankruptcy! One of the purposes of the scriptures is to show us how righteous people respond to temptation and evil. In short, they avoid it! Joseph ran from Potiphar’s wife.3 Lehi took his family and left Jerusalem.4 Mary and Joseph fled into Egypt to escape Herod’s wicked plot.5 In every instance, Heavenly Father warned these believers. Similarly, He will help us know whether to fight, flee, or go with the flow of our unfolding circumstances. He will speak to us through prayer, and when we pray, we will have the Holy Ghost, who will guide us. We have the scriptures, the teachings of living prophets, patriarchal blessings, the counsel of inspired parents, priesthood and auxiliary leaders, and, above all, the still, small voice of the Spirit. The Lord will always keep His promise: “I will lead you along.”6 The only question is, will we let ourselves be led? Will we hear His voice and the voice of His servants? With those principles as a foundation, may I give you some practical counsel? Many of your generation are facing crushing debt.When I was a young adult, my stake president was an investment banker on Wall Street. He taught me, “You are rich if you can live happily within your means.” How can you do it? Pay your tithing and then save! When you earn more, save more. Don’t compete with others to have expensive toys. Don’t buy what you can’t afford. Many young adults in the world are going into debt to get an education, only to find the cost of school is greater than they can repay. Seek out scholarships and grants. Obtain part-time employment, if possible, to help pay your own way. This will require some sacrifice, but it will help you succeed. Education prepares you for better employment opportunities. It puts you in a better position to serve and to bless those around you. It will set you on a path of lifelong learning. It will strengthen you to fight against ignorance and error. As Joseph Smith taught: “Knowledge does away with darkness, suspense and doubt; for these cannot exist where knowledge is. 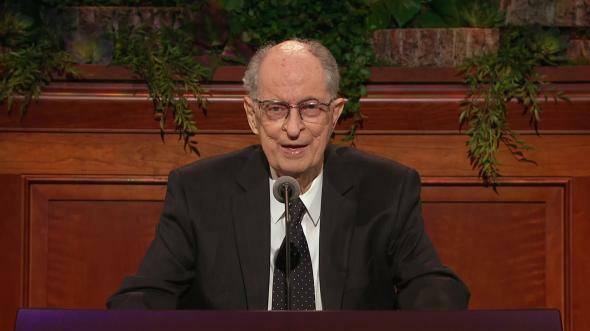 2) Elder Gary E. Stevenson of the Quorum of the Twelve Apostles shared a one line gem that i loved and think that it can apply to several categories of our lives, including our finances. 3) And Lastly, Devin G. Durrant of the Sunday School General Presidency offered the following challenge. “I would like to extend to each of you two invitations. The first has financial implications. With the second invitation, the implications are spiritual. Both invitations, if accepted,will require a disciplined effort over an extended period of time to reap the rewards.